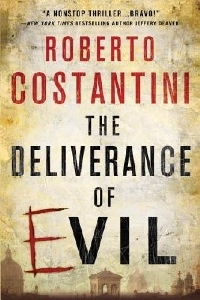 The Deliverance of Evil is Roberto Constantini’s epic opening to a trilogy featuring Commissario Michele Balistreri. It’s been causing a stir in Italy since its publication (as Tu Sei il Male) in 2011, going into three reprints in its first week and winning the prestigious Scerbanenco Prize for the best Italian debut crime thriller. The Deliverance of Evil is set against a backdrop of an Italy that swings from celebration and swaggering self-confidence to political and economic pressures and uncertainty about its identity and future. Like the very best thrillers, it holds a mirror up to the darker side of our society and forces us to ask questions of ourselves and who we really are. The novel opens in 1982, when the nation is gearing up for a World Cup final against West Germany. Michele Balestreri is too busy celebrating to fully focus on the disappearance of a teenage girl. When Elisa Sordi is later found dead, floating in the Tiber, he’s consumed with guilt. An arrest is made, but his suspect is exonerated and when links to the Vatican and right-wing politics emerge, doors start to close in his face. There’s no arrest, the case remains unsolved and Balestreri spirals into drinking and depression. 2006: it’s a very different Italy celebrating a World Cup win. Economic depression is widespread, racism is on the rise and the Berlusconi regime seems impotent, arrogant and corrupt. Women are being murdered; a single letter carved into their stomachs. Commissario Balistreri believes they may be linked to the Sordi murder. Then he realizes that the letters are spelling out a message, and it’s a message for him. This time he’ll fear no evil. And this time, nobody’s going to get away anything, whatever the cost. We don’t have a date for the translation of Alle Radici Del Male, the second in the trilogy. The rumour is that it’s even better than it’s predecessor. Watch this space.